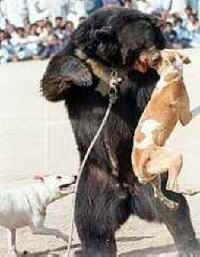 (Pakistan)– Arguably the most brutal of all bloodsports: declawing/detoothing of bears and allowing 2-6 dogs to attack them. This is doubly offensive because both creatures can sustain horrific wounds and even die. Almost unbelievably, this medieval pastime still continues now in the 21st century. Where does bear baiting occur in Pakistan? Latest fights occurred in Punjab, Sindh and Baluchistan. These are rural towns in the North of Pakistan. When did it start? First the Gypsies danced their bears for money. When the British began their rule, they introduced animal baiting as a sport, using Bull Terriers. The sport has escalated since 1940. Bear hunting has also grown as a result of widespread ownership of firearms and was used to develop relationships with the British. It was banned by the Pakistan Legislature under the Prevention of Cruelty to Animals Act (1890). Islam forbids inciting animals to fight one another. Who is involved? Grazier -migrating, pastoral people who herd their own sheep, goats and cattle. They capture the bear cubs near NWFP, also from Nooristan in Afghanistan. Traders – purchase the bears, pierce their muzzles with rings, remove the incisors and canines. Beat the legs of the bears and manipulate the sensitive nose ring – to make the bears dance (some known to dance on hot coals). * Landowners – powerful land-barons and landlords, prominent businessmen – however some do not get involved, and may be more interested in horse and greyhound racing. The less powerful landlord use their dogs as an affirmation of their status. Audiences – youth and older men. Local landlords and police. What type of dogs are involved? Pit Bull Terriers, mixed with a local breed “Kohati” – males are used from the same litter for inbreeding. At what age is a bear forced to fight? Any time from 3 years old upwards. Maybe younger. Most die by age 4 – 7 years. Life expectancy in the wild 20 – 30 years. One owner had 7 bears in 5 years. What are the rules of the game? * Bear tied to central pivot by a rope 2 – 5m long. * 2 – 6 dogs target head area. * If the dog can attack head area and pull bear down, forcing bear to roll then the dog wins. * Bears wins if it can remain on its feet. This is rare. * Landlord usually wins. * Bear rises to its hind legs and tries to beat the dogs off. * Smaller bears tuck their heads under their bodies. How long is a fight? Depends on how soon the bear surrenders or scores points. Intervals of 2 – 3 minutes between fights. Gypsies douse water onto the wounds but no medical treatment given. Bears usually do not get water during an event. The bear is made to dance a little jig after it has been beaten by the dogs! One bear had his nose almost entirely ripped open. He had to endure another three further attacks after his first fight. One female bear had to endure three attacks until she was exhausted. 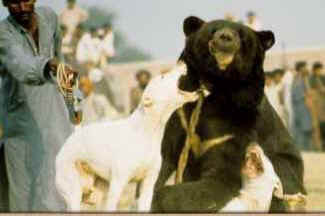 Habitat Integrated Pakistan plans to set up a sanctuary for the confiscated bears – Pakistan Government to oversee it. A registration system such as microchip tagging of all bears in captivity. No newborn bears to be captured and traded. Confiscation of any unregistered bears found. Update national laws in these regions. School children must be educated and public awareness campaign has begun, to teach morals and ethnic arguments against bear baiting. Public poster and school talks have been introduced.